Originally published in 1988 as Kansas Geological Survey Educational Series 4. This is, in general, the original text as published. The information has not been updated. This publication could not have been completed without the contributions of several people. Jennifer Sims created the cover design, layout, and illustrations. John Charlton took many of the photographs and printed those from the Survey. Fred Terry edited the copy. Chris Maples, Lynn Watney, Marla Adkins-Heljeson, Rex Buchanan, Pieter Berendsen, and Frank Wilson reviewed the manuscript. Shelley Marcotte typed the manuscript. David Collins created the computer-generated map of Kansas elevations. The Kansas Historical Society and the University of Kansas Museum of Natural History provided photographs and information. Imagine it's a nice summer day and you decide to take a walk in the Kansas countryside. Being in an adventuresome mood, you get off the road and head through open country. In the distance is a large body of water. From the shore it looks bigger than any lake you've ever seen in Kansas. You can't even see the other side. Strolling along the shore picking up seashells, you decide to take off your shoes and wade in. Suddenly, a fin splits the water and cuts rapidly and silently toward you. A giant mouth filled with sharp teeth pops out of the water and you're nose to nose with one long, sharp shark snout. You can hardly lift your feet out of the oozy mud as you turn and slowly struggle through the water with a mean and hungry shark on your tail. Just when you think you'll be shark supper, the shark turns, as if you're of no interest at all. As you recover on the beach, a giant shadow passes over. Looking up, you see huge featherless birds circling around. But they're not birds at all. They're giant reptiles with nearly 20-foot wings. Grabbing your shoes, you don't wait around to see what else this beach has to offer. You run for miles before stopping to check where you are. By now you're hopelessly lost. Down the road the scenery turns into rolling grasslands, broken by an occasional clump of trees. This scene doesn't seem too unusual for Kansas, but the hippopotamus wallowing in the pond to your left looks out of place. To your right a camel stares as you pass. Things are definitely a little strange. Soon you're heading across a hot, dry desert covered with sand dunes. As quickly as the desert appeared, the temperature plunges and the ground is covered with ice. Sudden weather changes aren't unusual in Kansas, but this is ridiculous. You realize you haven't seen any people or buildings since you started this trip, and, by the way, this really isn't what Kansas is supposed to look like. Just when you think you'll never see civilization again, the ice is gone and you're heading across a grassy plain. You come across a well-worn path and turn down it. Ahead a large cloud of dust appears. It's moving rapidly toward you--closer and closer. Suddenly, large, hairy animals come roaring out of the dust. Scrambling up a nearby hill, you turn to look just in time to see the spot where you had been standing swallowed up by a herd of bison. Eventually the herd and dust rumble on down the path. You scan the horizon for more stampeding bands of bison, when off in the distance--could it be?--a truck zips over a hill. Maybe it's just a mirage, but at least it doesn't have sharp teeth or huge, flapping wings, and it's not headed toward you with a hungry look on its grill, so you figure it's worth checking out. When you reach the spot where you sighted the truck, a road appears and things begin to look a little familiar again. Heading down the highway, you eventually find your way home for a good night's sleep. In the morning, you wake up and hesitantly open the curtains. Everything is the way it should be. Running to the library, you search for information on Kansas landscapes and wildlife. 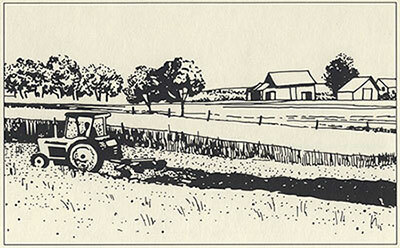 You find that Kansas has grasslands, hills and trees, and many farms, towns, cities, and about two million people. Also a variety of animals including coyotes, deer, skunks, and many birds and fish are now found in Kansas, although none from the shark family and definitely no large flying reptiles. But where are the sea, the desert, the massive ice fields, the hippopotamus, camel, and bison that you saw? Reading on, you discover that in the past, Kansas has had all of these landscapes and has been home to all of these animals at one time or another. You have been on a trip--not only through Kansas, but through time. Long before people were on Earth, Kansas was here. Of course, it wasn't called Kansas because no one was around to call it anything, and it didn't always look the way it does today. Over the years, many changes have taken place. Figure 1. 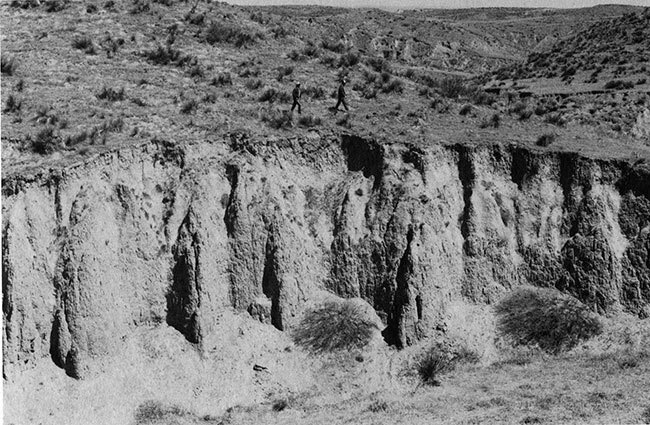 This bluff was formed when soil was eroded by water in Cheyenne County in northwest Kansas. The Earth is billions of years old. In Kansas, hills were formed that were later buried or worn away by wind and water. Seas covered parts of the state, then disappeared. Giant sheets of ice called glaciers moved into northeast Kansas, then melted. Rivers changed their courses. The climate changed--sometimes hot, sometimes cold, sometimes wet, sometimes dry. These changes are what made Kansas look the way it does today. Looking around, it's hard to believe that changes are still taking place. We rarely notice them because they happen so slowly. But every time it rains or the wind blows, dirt and rock are worn away from hills, valleys, and plains. This process of wear and tear is called erosion. Over just a few years or even a few hundred, it's hard to tell that things are changing, but over millions of years whole mountains may erode away or be buried. Sometimes changes happen more quickly. Floods can cause rivers to change course almost overnight. The Missouri River, which is the state line in northeast Kansas, has changed course several times. Small areas of land that were once on the Kansas side of the river are now on the Missouri side. Missouri has also lost some land to Kansas. Figure 2. 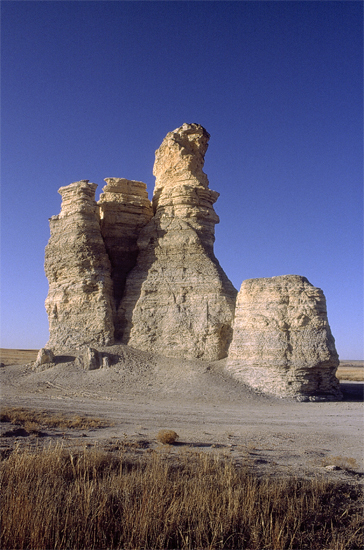 Castle Rock is a natural chalk sculpture in Gove County in western Kansas. 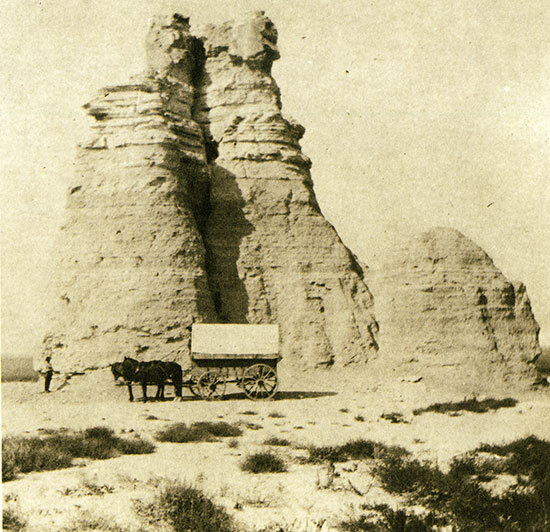 In this photograph, taken in the late 1800's, Castle Rock had two spires taller than the rest. One of the spires eventually toppled (photo courtesy of the Kansas Historical Society). Figure 3. Today Castle Rock only has one tall spire. The other one collapsed due to erosion by wind and water. Wind and water are just two of the many forces that are changing the world around us. The force of gravity, which holds us to the Earth, causes eroded rocks to roll off mountains and hillsides into valleys and river beds. Unstable conditions inside the Earth also cause changes. Volcanic eruptions, such as Mount St. Helens in Washington in 1980, can cause immediate changes. When Mount St. Helens erupted, the top of the mountain blew off and volcanic ash was carried thousands of miles by the wind. Millions of years ago, active volcanoes in New Mexico, Wyoming, and California erupted and large quantities of ash were carried into Kansas. Today, volcanic-ash deposits can be found in western Kansas. Earthquakes, which accompany volcanoes or the shifting of underground rocks, can change the environment. Most earthquakes in Kansas are small and can only be detected by sensitive equipment. However, some have been intense enough to cause damage. In 1867 an earthquake in northeast Kansas shook buildings, knocked over chimneys, and cracked walls. Most changes caused by earthquakes are underground and not as obvious as changes caused by volcanoes. But, over time, earthquakes help to change the way the surface of the Earth looks. People also have greatly changed the environment by plowing fields, quarrying rocks and minerals, building cities and roads, and damming rivers. Try to imagine what Kansas would look like without farms, buildings, roads, and cities--without people. How do we learn about geologic changes over time? Without people to write books or take pictures, the only records we have of the Earth's early history are hidden in the land around us. Since the Earth isn't talking, scientists must search for answers. The study of what the Earth is made of and how it changes over time is called geology. Scientists who study the Earth are called geologists. Figure 5. Xiphactinus was a type of fish that lived in the sea that covered western Kansas in the Cretaceous Period of the Mesozoic Era. 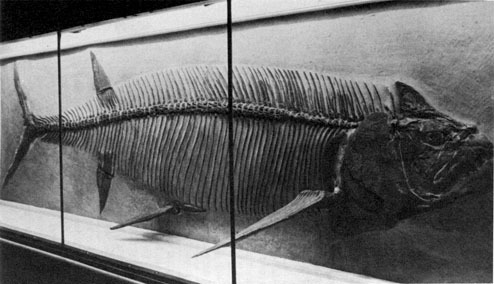 This one, which is about 13 feet long, was found in the late 1800's and is on display at the University of Kansas Museum of Natural History (photo courtesy of the University of Kansas Museum of Natural History). After years of studying the rocks, minerals, and features of the Earth, geologists have learned much about its geologic history. They have determined that the Earth is approximately 4 1/2 billion years old, give or take a few million years. The Earth is so old, no one knows its exact age. Because 100 years seems like a long time, something billions, even millions, of years old is almost impossible to imagine. To make it easier to understand geologic history, scientists have divided all the time since the Earth was formed into four eras. Figure 6. Scientists have divided time into units called eras. Eras are divided into periods, and periods into epochs. Dinosaurs lived during the Triassic, Jurassic, and Cretaceous Periods of the Mesozoic Era. We live in the Holocene Epoch of the Quaternary Period of the Cenozoic Era. The first era, called the Precambrian, was much longer than any of the others. It lasted almost 4 billion years, or 88 percent of the Earth's history. Although the Precambrian Era includes much of that time, we know very little about it. Rocks formed during the Precambrian have gone through many changes; in Kansas and many other places, these rocks can only be found hundreds and even thousands of feet underground, making them difficult to study. After the Precambrian Era, more plant and animal species began to develop. During the Paleozoic Era, which followed the Precambrian and lasted 245 million years, plants and reptiles began moving from the sea to the land. The era has been divided into seven smaller units of time called periods. Several times during the Paleozoic Era, seas appeared and disappeared in Kansas. Rocks from the last three periods in the era, called the Mississippian, the Pennsylvanian, and the Permian periods, can be found at the surface in central and eastern Kansas. Dinosaurs appeared and disappeared during the Mesozoic Era, which lasted 160 million years. Not many dinosaur fossils have been found in Kansas. During the first part of the Mesozoic, much of the surface in Kansas was being eroded. If dinosaurs lived in Kansas then, they weren't preserved. Later in the era, in the Cretaceous Period, much of the state was covered by seas. Because the land was under water, not many dinosaur fossils have been found, but bones from giant swimming and flying reptiles have been recovered in western Kansas chalk. We're now in the Cenozoic Era, which began about 63 million years ago. Because it is the most recent era, we know the most about it. The glaciers that moved into Kansas from the north came during this era. Later, giant dust storms carried the soil away from some areas and deposited it in other places. As mountains were formed by volcanic activity in the western United States, layers of volcanic ash were deposited in Kansas. Figure 7. This spiral shows the length of each era and period. Start at the bottom. 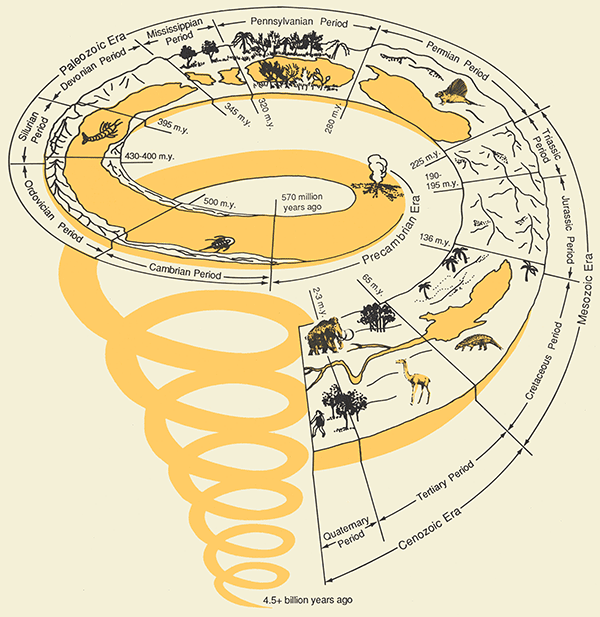 If the spiral were 10 miles long, you would travel nearly nine miles before reaching the end of the Precambrian Era. The Paleozoic Era would be a little more than half a mile long or about the length of 11 football fields. The Mesozoic Era would be less than half a mile, or about eight football fields long. The Cenozoic Era would only be 200 yards long, or the length of a couple of football fields. People in Kansas would appear about two inches from the edge. As time passes, the spiral will slowly continue to grow, about one inch every 7,500 years (after Geologic Time, U.S. Geological Survey publication). Placed on web Feb 11, 2016; originally published 1988, reprinted 1995.